This is an excellent set of data from Dealroom.co analysing how European tech investment performed last year. Total investment grew 12% to €16bn. A pullback in the UK and Germany was compensated by a strong performance in France, Sweden and Israel. Corporate investment rounds grew 33% to €4.9bn. We are seeing a much greater appetite from corporates to both invest in and acquire innovative tech companies to respond to the threat from new technologies to existing businesses. A 10x increase in deep tech investing over the last 5 years to €2bn makes me hopeful for the future of European tech. 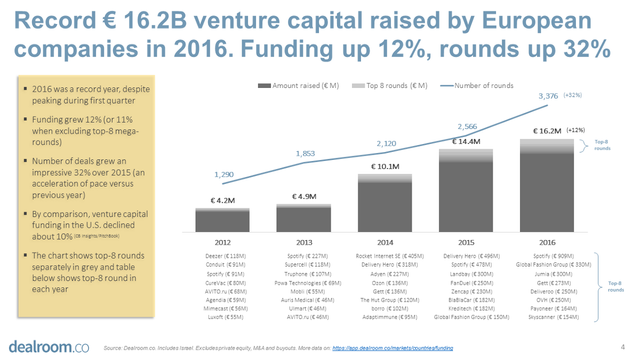 European companies raised € 16.2 billion (US$ 17.3 billion) in venture capital, an increase of 12% versus the previous year and an all-time record. The number of rounds grew by 32%, from 2,566 to 3,376. By comparison, U.S. venture capital funding was down by about 10% from $ 70-80 billion in 2015 to $ 60-70 billion in 2016. All this despite Europe struggling with a bunch of political and economic upheaval (Brexit, deflation, regional unemployment rates of 12-25%).As a result, European tech companies in aggregate have more capital at their disposal than ever before, to invest in their product and acquire customers. On the one hand, competition for the same customers will heat up even further, but on the other hand much of Europe is still wide open in terms of the online migration “land-grab”.